One of the important of creating a responsive webpage is the fact that you will safe yourself the stress of managing two site. That is, the main site which will be for desktop and also the m-dot site which will be for mobile device. But if you were running an m-dot site before and have not created a responsive site, then you are faced with the choice of either keep maintaing the m-dot site or to scrap it out completely. To me, scrapping out you m-dot site after you have created a responsive site is not the best of choice. Rather, I recommend you doing a 301 Redirect server configuration. 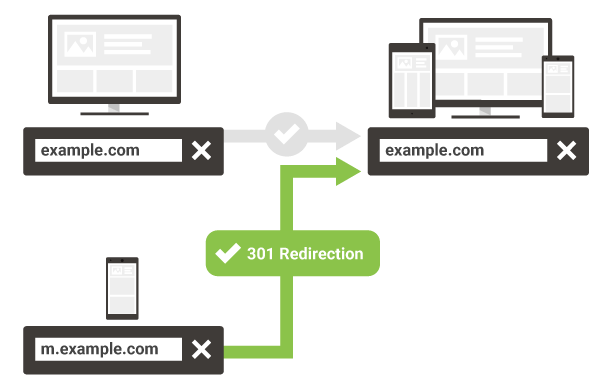 The 301 Redirect configuation will ensure that your site users who have bookmark a page in your m-dot site will still have it bookmark working, for what the 301 Redirect does is to automatically redirect all your visitors of your m-dot site to your responsive site. And there is more benefit of using 301 Redirect, click >>> HERE <<< to learn of the benefits.